The Goons first came together in a pub called Grafton's in London's Victoria. The pub was a popular meeting place for actors, comics and writers in the early post-war years, with landlord and scriptwriter Jimmy Grafton serving up advice and encouragement along with the beer. Spike Milligan was renting a room above the pub and working on comedy scripts with Grafton - who became known as KOGVOS, Keeper of Goons and Voice of Sanity - when his wartime friend Harry Secombe, introduced him to Peter Sellers and Michael Bentine. There then began a terrible rasping, squealing, giggling, snorting period of lunacy which continued unabated until 1960. 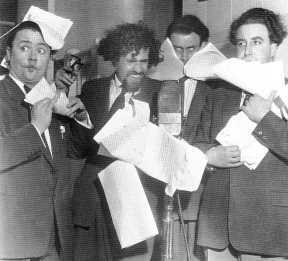 The Goons first went on air at the BBC as The Crazy People on 28 May 1951. It wasn't until the second series in January 1952 that the BBC agreed to changing the name of the show to The Goon Show. 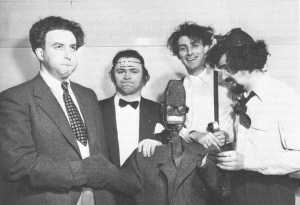 Spike Milligan, of course, became the driving force behind The Goons, writing the scripts and devising the characters which became part of our comedy heritage. Peter Sellers, Harry Secombe, Spike Milligan, Michael Bentine, The Ray Ellington Quartet, The Stargazers, Max Geldray and The BBC Dance Orchestra conducted by Stanley Black. Announcer Andrew Timothy. Produced by Dennis Main Wilson. Wallace Greenslade announced from series 5 onwards. The final episode in the tenth series was broadcast on 28th. January 1960. Peter Sellers died of a heart attack July 1980, following an illustrious movie career. Michael Bentine, who enjoyed solo success, died in November 1996. Harry Secombe died, following a stroke, in April 2001 after many TV, radio and stage appearances as an actor, singer and presenter. Spike Milligan was awarded a British Comedy Award for lifetime achievement in 1995, and the Prince of Wales gave him an honorary knighthood in 2001, a year before his death in February 2002. Spike Milligans Adolf Hitler: My Part in His Downfall is playing at the Hampstead Theatre from 22 July  22 August. A man called Chamberlain who did Prime Minister impressions spoke on the wireless; he said 'As from eleven o'clock we are at war with Germany'. (I loved the 'we'). 'It must be something we said,' said Father. This hilarious, irreverent romp through Spikes adventures as Gunner Milligan is based on his celebrated war memoirs, using his own words and featuring live performances from a jazz quartet. It has just transferred to Hampstead from a brilliant run at the Bristol Old Vic, where it has been hailed as joyously funny (Guardian) and as wacky as Spike (Telegraph). Contains barrack room humour!